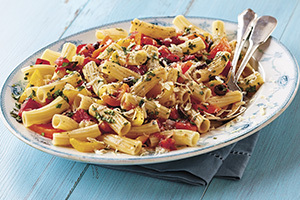 Keeping pasta in your cupboard ensures a quick meal on a busy weeknight – or any night of the week. If you like a little heat, add a pinch of crushed red pepper flakes with the tomatoes and olives. Add some cooked chicken if desired. Serve with crusty bread. In large pot of lightly salted boiling water, cook pasta for 8 to 10 minutes or until tender. Meanwhile, in large skillet heat oil over medium heat. Cook peppers, garlic and onion until lightly softened, about 5 minutes. Add wine, olives and tomatoes; increase heat and bring to simmer. Cook, uncovered until hot and bubbly, about 3 minutes. Drain pasta; add to skillet and toss. Stir in basil and sprinkle with cheese.